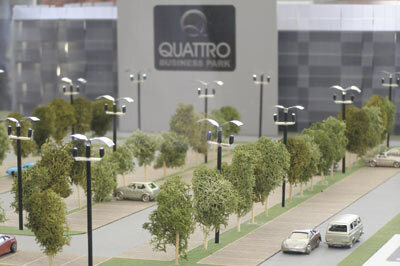 Krakow-based developer Grupa Buma recently commenced construction of one of its largest projects, Quattro Business Park. Over the next four years, this impressive building site located on Gen. Bora Komorowskiego Avenue will be developed into a modern office complex consisting of four 14-storey buildings, totaling 48,000 square metres of class-A office space. Designed by the APA Kurylowicz & Associates architectural studio, the 150 million euro project will also comprise a 200-person conference centre, restaurants, medical clinics, and other small service shops. Additionally, the complex will include parking facilities allowing for up to 1,100 cars. As the largest office project currently under construction in southern Poland, Quattro Business Park is to be built in four stages. While the first of the four buildings is scheduled for completion in December 2009, the second building and multi-level car park are planned to follow in October 2010. The remaining two buildings are expected to be finished in 2011 and 2012. “This development is a confirmation of the repeatedly-proven thesis that, second to Warsaw, Krakow is the place for construction,” states Deputy Mayor of Krakow Kazimierz Bujakowski. “The undertaking of such an investment, which commits itself to a strategy of development for the city, is strategically essential. It establishes the conditions for those firms who have invested here and are operating to expand.” During his speech at the opening conference on Sept. 4, Bujakowski focused on the changes Krakow has undergone over the last decade or so, specifically its growth from an industrial city to one that is service orientated. According to Bujakowski, “Krakow has become a centre for services: a centre for IT as well as accounting and business services. One of the crucial restrictions that determines further investment by firms is restricted availability of commercial office space.” Bujakowski maintains that of the 240,000 square metres of office space Krakow acquired between 2005 and 2007, 95 percent is in use, a fact that justifies the immense scale of the Quattro Business Park enterprise. The plans and architectural renderings for the new office complex are certainly striking, effectively transmitting the concept of a contemporary design. Moreover, for employing an environmentally friendly approach, a façade of glass and tiles allows for natural light to enter, cutting the energy demand of the buildings. Since its establishment in 1991, Grupa Buma has completed several office investments in Krakow, such as Buma Square Business Park, Rondo Business Park and the ONYX office complex. The group has also built over 1,700 apartments and 270 single-family homes. More than 50 firms in Krakow rent space in buildings developed by Grupa Buma.